It has been a busy spring for the VentureWeb team, launching new and revamped websites and kick starting work on some exciting new projects. Here’s a quick summary of what we have been doing in between skiing, mountain biking and hiking. Santa Cruz Bicycles have been a leader in the bike industry since their inception in 1993, consistently pioneering new standards for mountain bikes. 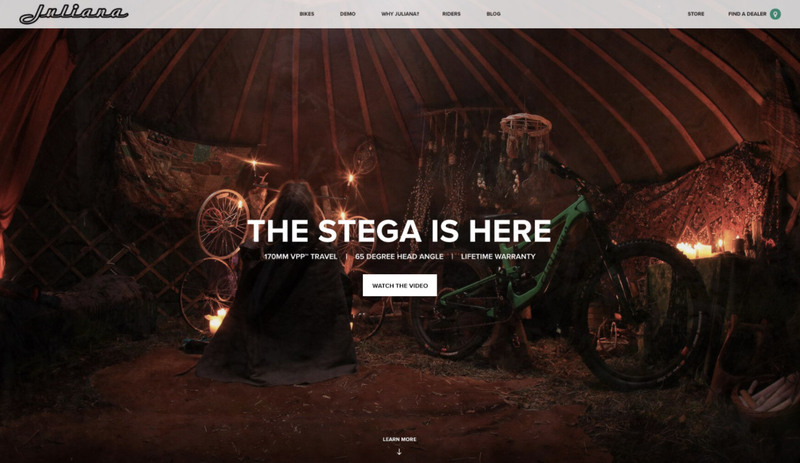 Santa Cruz prides itself on offering its customers the ability to customize its bikes and it approached VentureWeb to create an innovative tool for building a bike online. In July of 2017, VentureWeb launched the new bike builder on the Santa Cruz website to coincide with the launch of its model year 2018 bikes and its brand new carbon fibre Reserve wheels. Built with React and Drupal as a standalone application, the bike builder enables consumers to select frame kit, material, color and upgrade options and it calculates price and weight on the fly. We have also been working with SCB’s sister company, Juliana Bicycles to release the all new Strega to great fanfare. Check out the spooky video. 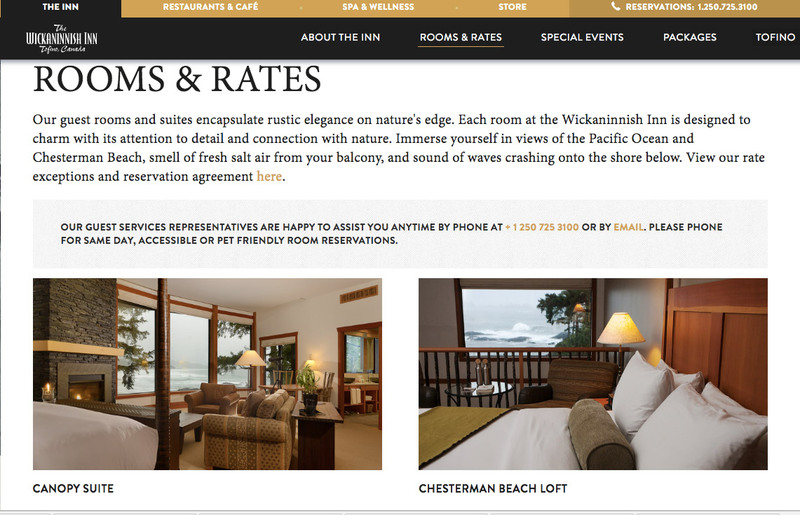 VentureWeb has worked with Tofino’s Wickaninnish Inn since 2012. A member of the Relais & Chateaux group, the Wick is celebrating 20 years of offering rustic elegance on the wild west coast of Vancouver Island. 5 years ago, we developed a website that shared the Wickaninnish’s brand and unique offerings, and introduced online booking capability. This spring we strategized and executed several key UX enhancements aimed at increasing online conversions. Some of the changes optimized the sales funnel - for example, including more ‘book now’ CTAs on the dining and spa pages and making contact information more prominent. Others improved the user experience - for example, adjusting the site navigation for mobile users and enhancing the layout and sub-navigation of the rooms page. Advanced data tracking and a visual analytics platform were integrated to ensure accurate measurement. In anticipation for the seasonal launch of the longest zipline in North America, Ziptrek Ecotours wanted a marketing initiative that was as captivating as their Sasquatch zipline. So it approached VentureWeb to bring the experience to life on mobile devices. 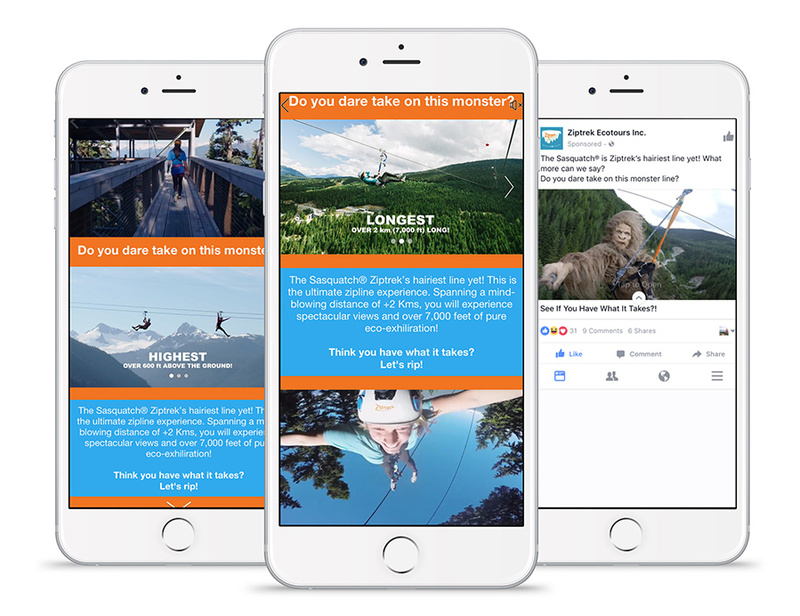 Utilizing the new Facebook Canvas functionality for interactive mobile ads, VentureWeb designed a full screen ad experience to bring the Sasquatch experience to life using video and highlighting key product attributes. The result has been significantly higher engagement than traditional Facebook ads. Squamish Rafting Company is a new business established by long term rafters and Squamish locals, Hazzard and Bob. Their mission is share their love for rafting and the wild beauty of Squamish with as many as people as possible. They asked us to create their brand logo and visual identity, develop a new website with a booking engine, and design print and visual materials including advertisements, a brochure, and signage. It has been really gratifying to work with a small local company from the ground up, ensuring that they launch their new business with a strong brand identity and a functional and good-looking website. The logo is simple and striking, and designed to be used in a variety of applications - tshirts, web, rafts, buses, and so on. The website is a simple, one-page site with integrated booking engine. Its design reflects the professional but fun ethos of Squamish Rafting Company, and the succinct content is intended to be engaging and informative.